Please feel free to contact us if the question you have is not listed. How much does a castle cost to hire? When are your castles available? How long do I get the castle for? Is there an age limit for children using the castle? How many people can a castle accommodate safely? Can the castle be set up on a slope? What type of surface can the castle be sited on? How long does it take to set up / inflate / deflate / pack away the castle? When I hire the castle is there anything I need to provide? Is there anything I need to do prior to your arrival? Do your castles meet the latest Health and Safety regulations? Do you supply safety instructions? The preferred method is by telephoning us, alternatively you can email or you can complete the booking enquiry form on the contacts page. 2. How much notice do I need to give for a booking? You can book at any time, however bookings get very busy so please book as early as possible to avoid disappointment. Alternatively you can contact us on the day as we may have availability. 3. How much does a castle cost to hire? Please see our castles for all prices; prices vary depending on your choice of castle, the equipment hired and your location. Most people choose to pay cash on delivery; we do not accept credit card payments and cheque payments need to be supported by a guarantee card up to the value of the hire. All standard booking prices include local delivery, a castle, a fan, an extension cable, an RCD circuit breaker (if required) and a safety crash mat; the booking price also includes set up and collection. 6. Do I have to pay a deposit? 7. What if I need to cancel? You can cancel at anytime, all we ask is that you give us as much notice as possible. If no notice is given you may incur a cancellation fee. 8. When are your castles available? 9. How long do I get the castle for? As most events are in the afternoon we deliver and set up your castle between 9.00 am and 12.00 pm. We will then come and take the castle away after your event has finished usually from 6.00 pm onwards, but no later than 9.00 pm. 10. Where do you deliver to? Delivery is free within the area shown and we may well be able to deliver outside this area for a small additional charge. Please contact us to discuss. 11. Is there an age limit for children using the castle? We have castles to suit all ages including adults. 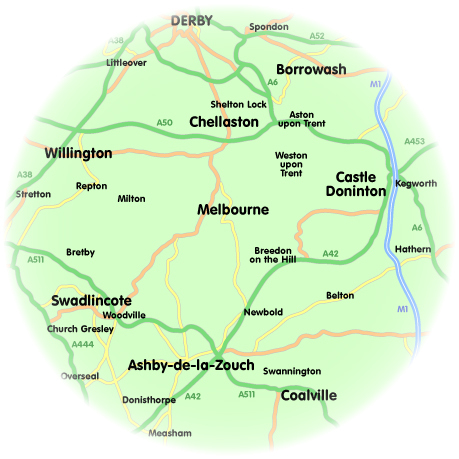 Please refer to our castles for specific information on any particular castle. 12. How many people can a castle accommodate safely? 13. What if it rains? Come rain or shine, all of our castles are fitted with a shower / sun cover as standard. 14. Can the castle be set up on a slope? Unfortunately this is not usually possible. However, it is sometimes possible to accommodate a very slight slope; you will need to discuss this with us prior to the booking. 15. What type of surface can the castle be sited on? The castle must be sited on grass. 16. How long does it take to set up / inflate / deflate / pack away the castle? A castle takes approximately 10 minutes to set up and 20 minutes to pack away. However this is only an estimate, times vary depending on which castle you hire. 17. When I hire the castle is there anything I need to provide? We supply all the equipment you will need for the castle; you will need to provide a 240 volts mains power supply. Alternatively, we can supply a generator at an extra charge. 18. Do you hire overnight? Under certain circumstance this can be arranged, please contact us. 19. How much space is needed? You will need to allow a minimum of 5 feet at the front and rear of castle and 2 feet either side this is to allow access and the blower at rear. Please be aware that a minimum height clearance of 10 feet is required from ground level for a 12 ft x 12 ft castle and 13 feet for a 15 ft x 16 ft castle. 20. Is there anything I need to do prior to your arrival? Yes, please make sure all garden items such as garden toys, swings, slides, patio furniture, rubbish, sharp objects etc. are removed from the area where the castle is to be sited. Also ensure that there are no protruding objects such as branches that could come into contact with the castle when erected. 21. Do your castles meet the latest Health and Safety regulations? Yes, all of our castles and equipment meet and in many cases exceed the current Health and Safety regulations. The castles and equipment are checked before each event and the castles are also independently checked annually. All electrical equipment has an annual PAT test. 22. Do you supply safety instructions? Yes, we provide detailed safety instructions with every hire.